Arrowhead Alpines Blog: Where are the violas? I used to say pansies and violas just weren't worth growing. Here in the midwest winter slips pretty quickly into summer, with only a brief bit of spring in between, giving a spring planted pansy only has a few weeks to get growing and flowering before it lives up to its name and wimps out in the summer heat. My opinion changed one year when I saw a neighbor plant one -- just one, for some reason -- yellow pansy in the fall. It gave a decent show for a few weeks, then disappeared under the snow. I though that was the end and had forgotten about it until the snow finally melted and almost instantly, while the rest of the world was still half-frozen mud, that lone pansy started stopping traffic with a solid mass of flowers. I learned my lesson. 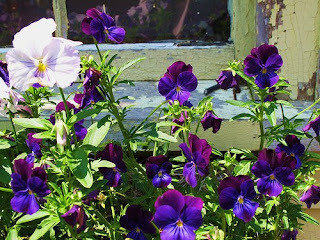 Pansies and violas, like tulips and daffodils, really ought to be planted in the fall so they can get established, overwinter, and start pumping out blooms while everything else is still underground. So why, of why, doesn't anyone have them for sale? I stopped at a local independent garden center last week. It had been overrun with pansies and violas in the spring, so I expected to find a good selection -- but no such luck... not a single one to be seen. I stopped at a big box store for another errand and found a measly selection of pansies. I bought a few even though I prefer the smaller flowers of violas better, and even though they were a mix of colors half of which I didn't want, because something is better than nothing. Once in they were in the ground, I knew I needed something better, so I trekked out to the good garden center, the one that is a good 30 minute drive away and has all sorts of cool stuff, confident they would have the cute, tough, smaller flowered violas I want in a wide range of colors. Ha. They had just a few pansies too, even less selection than the big box store. I was devastated and had to comfort myself by browsing through the discounted perennials and buying a dozen Digitalis thapsi for only a $1.50 each. 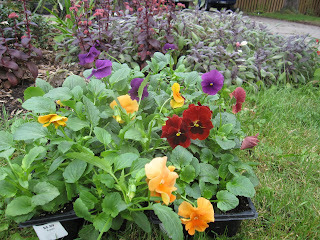 This put me in a better mood, and I did end up buying a few trays of their pansies. So I had to settle for pansies. Pansies which are pretty, of course, but I wanted violas. I was ready to spend vast amounts of money on violas to ensure that I would have a knock-out show next spring and... no luck. Independant garden center owners, if you are listening, this is why I end up spending less and less money every year at your stores, and more and more on mail order seeds. Now I know that if I want violas in the fall, I'm going to have to order seeds and grow them myself. Unless anyone knows of somewhere selling violas right now in Michigan? Hi Joseph, I admire your search for violas, finding them superior to the larger pansies as well. I can't help with your search, but can suggest that you let your local nurseries know that you would buy them by the flat, not the little pack or pot if they had them. We are lucky to have a local nursery, Mouse Creek that holds flats of them for me until planting time, mid October here. I like to put them over the newly planted bulbs to mark them and it makes a pretty show in spring. You could call up a wholesaler. I think too many people forget about gardening in the fall, even though it's the best time to plant. Garden centers should be selling loads of perennials/trees/shrubs/winter annuals, and not look like the seasons done and everything's on clearance. (Although sales are wonderful). Start ordering seeds now to grow your own next late summer! I can send you some if you like. I've got Amber violas http://www.botanicalinterests.com/store/search_results_detail.php?seedtype=F&seedid=318 and Bewitched pansies http://www.botanicalinterests.com/store/search_results_detail.php?seedtype=F&seedid=253. I prefer the little violas, too, but they are not to be found in the fall. Just pansies, so pansies is what I plant. It's fine with me, though, because I actually like the darker colored pansies for fall, and the lighter colored pansies and violas for spring. So the pansies that I plant in the fall that make it through the winter always cause conflict for me... wrong color for the spring season. I appreciate also how you consoled yourself with... more plants. Did you buy enough? Go back, get yourself some more! I grew up in Nebraska and felt the same way about Pansies. My first winter in Portland, however, set me straight...they can bloom here all winter long...it's a little insane to me! I do prefer violas though...I like lots of smaller flowers, rather than a few large ones.